Call of Duty: Advanced Warfare's campaign mode is entertaining enough, as long as you can turn off your brain for a few hours. Leave it on and you'll trip over the gaping plot holes every couple of seconds. Advanced Warfare is a Call of Duty game, after all, and there's never been a Call of Duty game praised for its deep and thoughtful story. That's why the folks at Playthroughline — the blog that explores how video games handle story — had such a field day creating the extensive movie-script breakdown of its sins. It starts seconds — SECONDS — into the game's campaign. Their mission, should they choose to... oh, I guess they have to. Soon poor Will Irons is no more, and we come to the famous funeral scene. Soon Mitchell is drafted into Atlas, the private military company run by his best friend of all time's dad, whom he's never met. Soon it's time for his first mission. It goes on and on and on. 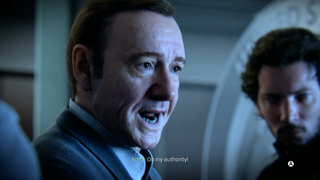 I seriously don't remember being this much story in Advanced Warfare. I probably blocked it out defensively. You can read the entire revised script over at Playthroughline. It's brilliant.